Holiday Jigsaw Christmas 4 brings you hundreds of high-quality photos with a holiday winter theme. Every correct piece connected brings you closer to enjoy images of holiday decor, beautiful winter views, heartwarming family photos, holiday treats and, of course, Christmas surprises and gifts! 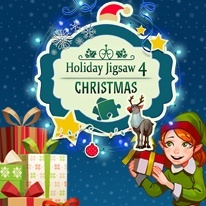 Gather the family around the computer and solve each puzzle together while listening to holiday jingles!